We get asked a lot about hybrids with seven seats. The answer is simple: There's only one, the 2012 Toyota Highlander Hybrid. But the question is really more about fuel efficiency: What family vehicles with a third row of seats that can carry seven people get the best gas mileage? It's a major question for larger families, those with kids on sports teams or other after-school activities ... and even sometimes just people who cart around a lot of people, for whatever reason. 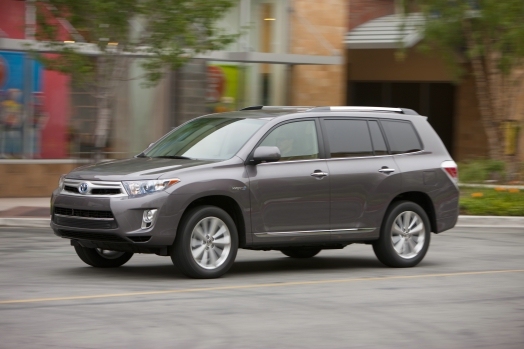 If you buy based on EPA gas-mileage ratings, the 2012 Highlander Hybrid is at the top of the list. But we'll focus on the top three here: one Japanese, one Korean, and one North American. For a complete and exhaustive list of no fewer than 30 separate vehicles with seven or eight seating positions, ranked by gas mileage, see "2012 Family Vehicles: The Most People, The Most Mileage" at our sister site, FamilyCarGuide.com. Available only with all-wheel drive and a 3.5-liter V-6 engine paired with Toyota's Hybrid Synergy Drive, the 2012 Highlander Hybrid is the unquestioned mileage champ of the seven-seat fleet. Considering that it outdoes two four-cylinder, front-wheel drive crossovers on combined EPA mileage rating, the benefits of Toyota's hybrid system are highlighted in the Highlander. That all-wheel drive, however, powers the rear wheels not through mechanically-linked drive shafts but with an electric motor, separate from the motors up front in the hybrid transmission that turns the front wheels. Unlike mechanical all-wheel drive, which will turn the wheels until the engine stalls, Toyota builds in circuitry to protect that rear drive motor from overheating. That offers at least a theoretical possibility that the rear wheels could be depowered right when you need them the most, in slippery mud or ice or on steep slopes. Toyota has all sorts of caveats in its owners manual about not using the all-wheel drive off road. Knowing a few Highlander Hybrid drivers, we don't think they spend a lot of time rock-climbing. It's more about muddy suburban soccer fields. If you opt for the Kia Sorento with the base 2.4-liter engine and six-speed automatic transmission, you can come within about 15 percent of the Highlander Hybrid's combined gas mileage rating--and for rather less money to boot. You'll have to forgo all-wheel drive as well; adding driven rear wheels to your Sorento takes the combined mileage down to 23 mpg with the four-cylinder engine, or an even lower 20 mpg if you opt for the more powerful 3.5-liter V-6. The base four-cylinder, front-wheel drive Sorento starts at $21,250, versus the all-wheel drive Highlander Hybrid at $38,140. You can buy a whole lot of gasoline with that extra $16,000-plus, though to be fair, the Toyota is far more lavishly equipped (as many hybrids are). 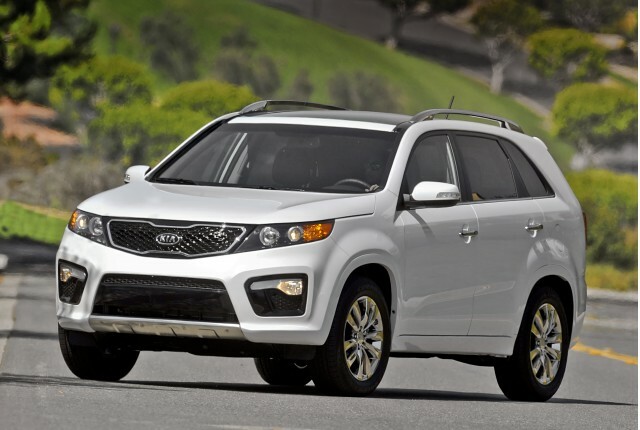 An all-wheel drive Sorento starts at $25,350, which is still almost $13,000 less. Finally, there's the all-new Ford Explorer. The old truck-based Explorer sport-utility is now a mid-sized crossover--and a much better vehicle. Order it with the 2.0-liter direct-injected and turbocharged EcoBoost four-cylinder engine and six-speed automatic, which comes only with front-wheel drive, and you can come fairly close to the Sorento's combined mileage figure in a vehicle that's newer, nicer inside, and offers a whole lot more available electronic features. The 2012 Ford Explorer has sold very well this year (though not as well as the smaller, older Ford Escape compact crossover, which has only five seats), proving that the durability of a truck isn't really what crossover buyers want. Instead, they look for lots of space to haul people and goods, a higher and more commanding driving position, and available all-wheel drive. And that's what Ford provides.